For all those Melbourne crafty types out there I’m sure you will be popping along to Finders Keepers market this weekend. I’ve just been, it was great, a visual feast of goodness. So many people with so much talent and so much good stuff. Go! Enjoy! It opens at 10am on Saturday, go early to avoid the hordes. Another conference this weekend, this time its the Big Hearted Business conference in Melbourne and I’m LOVING it, so many great speakers and super people attending. I get to make pom poms today with the lovely Pip Lincolne from Meet Me At Mike’s . So much fun. 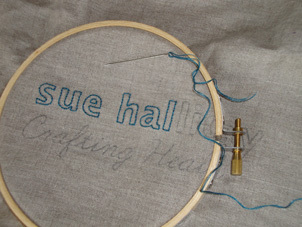 I see some new business plans being sown (or should I say sewn!) and I feel VERY excited about this. Will share soon. Stay tuned! In Melbourne it’s hot. Super hot. It was meant to peak at 38 degrees C at 5pm tonight. It’s certainly super warm. And we do not have aircon at my house. so yes, super warm indeed. It is somewhat unfortunate therefore that I really really really want to crochet and finish off my blanket that brings me lots of joy as super hot heatness and thick woolly crochet blanket do not really go together. Do you cross the street to walk on the sunny side? I do. Mostly. This afternoon in chilly Melbourne the sky was super blue and the sun did shine. I crossed the street and soaked it up. 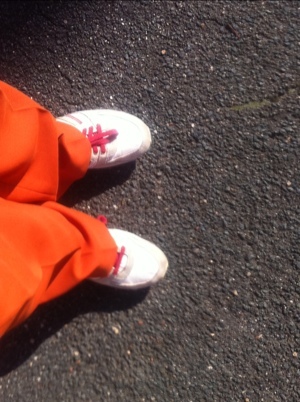 Happy in the sunshine in orange slacks and sneakers. 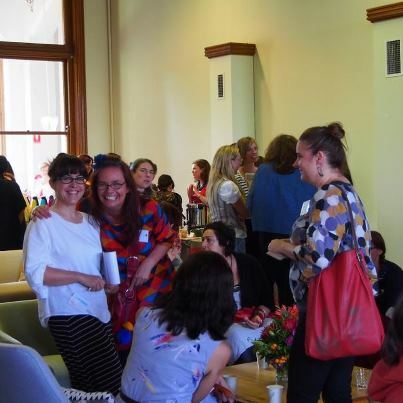 Yes, I was on the tele last night, celebrating the fabulous Pip Lincolne originated craft group ‘Brown Owls‘, hopefully conveying some of the inspiration that she and it have given me since my arrival in Melbourne. Here is my story, of fact, not fiction, which I feel like sharing; especially with those that may be thinking of joining a craft group and may have a few first night nerves. I had such a lovely day the other day. I marvelled at the wonders of colour and scent as i passed an eclectic and beautiful mix of front gardens in my neighbourhood, on the way to the park with a dog called Jelly. A man of slightly elderly age passed by, I wished I had a cap so I could doff it at him, instead we exchanged smiles – nice! 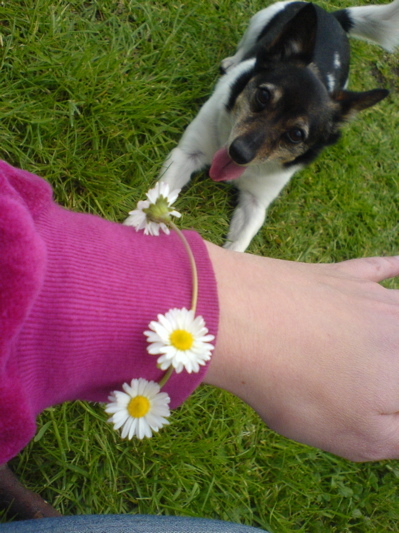 I played ‘stick’ with Jelly a while and sat in the sun and soaked up some vitamin d and made a daisy chain. I marvelled at the ease of making a daisy chain in comparison to the frustration that it caused me as a young nipper. A walk in the park, an exchange of human kindness, a dose of sun and a reminder of the healing power of nature in all its spectacular wonder – a right old boost to health and only minutes from my front door – brilliant! 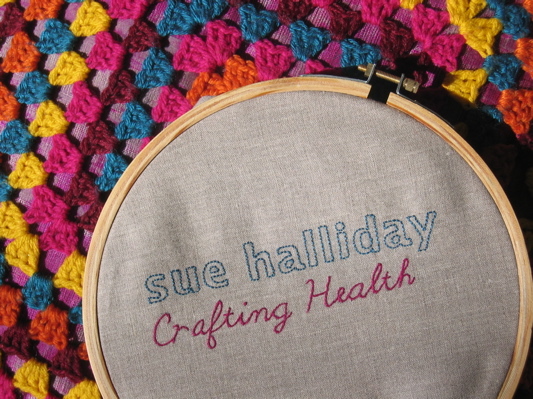 The Crafting Health website is in the process of being stitched, hemmed and generally being put into great shape.